This is a special scrapbook page. I love taking selfies!! 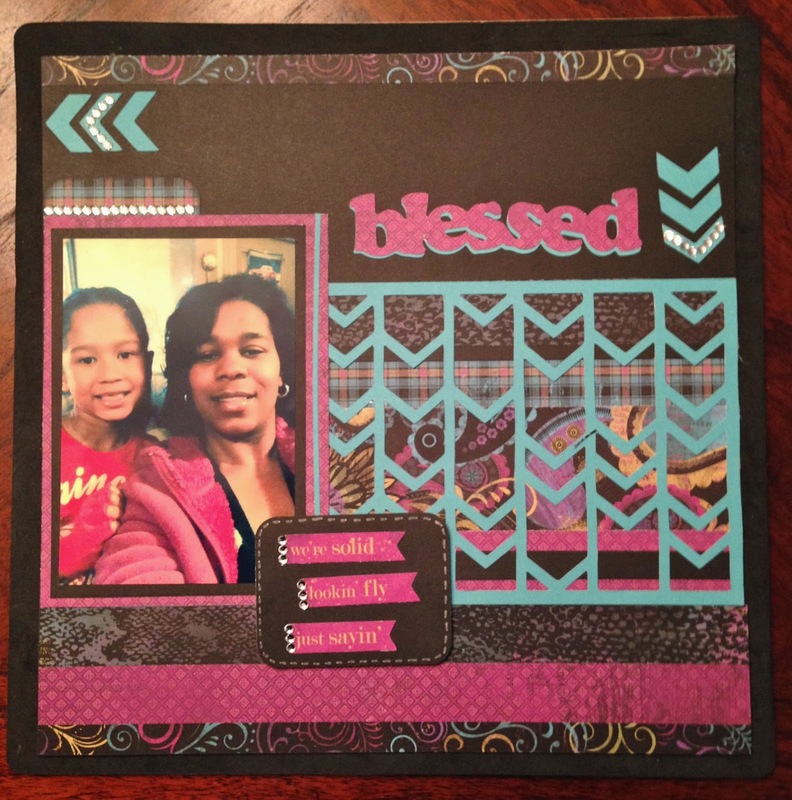 This one is of my youngest daughter and I. I entered this into the Fantabulous Cricut Challenge Blog. The challenge is to use a sentiment and have at least 1 cricut cut on your project. Easy Peasy with the CTMH Artbooking cricut cart!! I used the sentiment "Blessed" because I truly am!! Nothing like having an incredible daughter to share my world with. This goes for both of my princesses!! I used Laughing Lola paper and Lagoon card stock. The overlay was cut from the Artbooking cricut cart pg 82. I places strips of different papers within the Laughing Lola paper pack behind the overlay. I used a few of the left over inside cuts of the overlay to make the directional arrows. The sentiment "Blessed" came from pg 85. I cut the sentiment out twice with different paper so I could layer it. I made a little journaling spot and used the zip strip from one of the papers because the sayings compliments us well---> "We're solid", "lookin fly" and "just sayin". I also like to add some bling with the bitty sparkles. I love all the bright colors!! I LOVE that you created an Artbooking page using a selfie with your sweet princess! I'm thinking I may have to scrap lift this one. :D Thank you for participating with us at FCCB this week! Terrific layout. I really like the pink and turquoise against the brown background! Thanks for joining FCCB's "sentiment" challenge this week!